With the sudden disappearance of creativity in and around Penticton the crew have moved over to the sleepy village of Greenwood. It’s a quiet ‘near ghost town’ high along the Highway 3 route across the south. 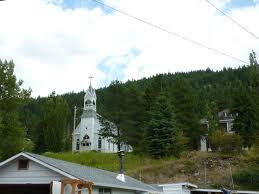 Promoted as BC’s smallest ‘city’ it boasts a population of 650 future ghosts at last count. Just last summer though, when it was a mere grade crossing in the corner, it was decided to enhance the scene somewhat. 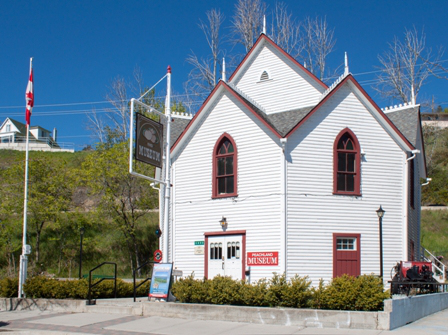 We had purchased of a supply of great new buildings with Penticton in mind but there were at least 4 that were unsuitable. Sleepy Greenwood it seemed would have a short, unexpected and unexplained construction boom. 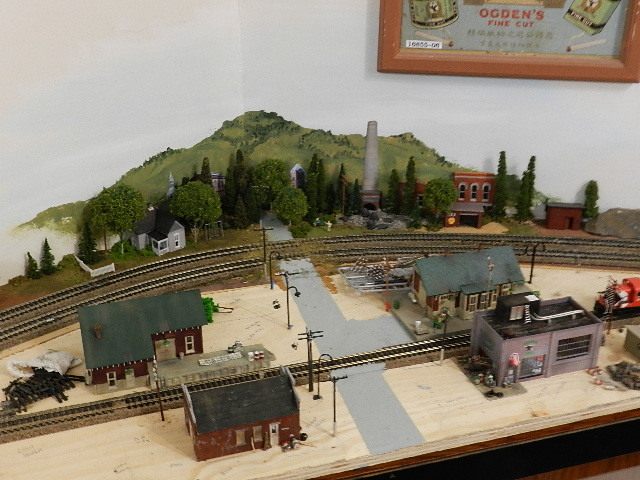 Tracks were torn up, land was acquired and the simple scenery was removed…..
Two of the old main line tracks remained where they were but the new acreage allowed for a single new “inside” track that would serve a small station and a few small buildings. The degree of industrial development was in dispute but I may have won that one. Happily, Imperial Oil will NOT be constructing their new billion dollar refinery in Greenwood. These small photos highlight the identifiable landmarks we wanted to include while keeping the space ‘small’ in scope…. The goal was to install our new structures while offering visitors who knew the area a glimpse of home. Some cut and paste was in order. Landmarks were built flat against the wall and new, small buildings would be organized on the new benchwork. 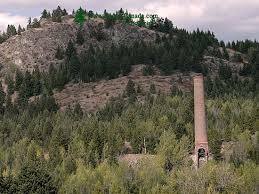 The old smelter was a priority. The bell shaped objects were created when containers of hot slag were dumped in the area. An odd tourist attraction indeed. A single small road would serve the new structures. 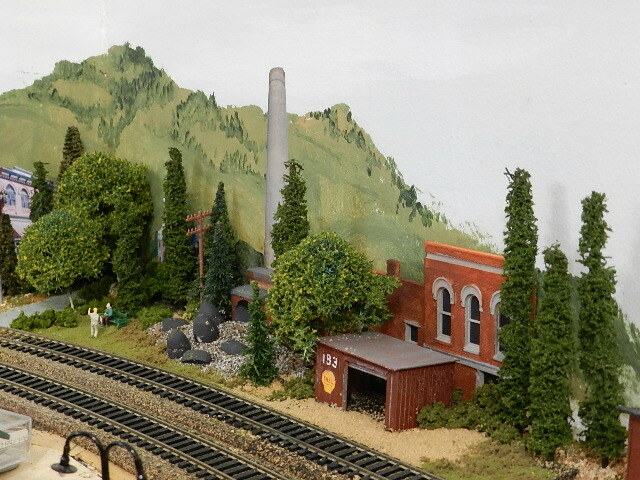 The station, a warehouse, a welding shop and a junk dealer. All having seen busier and better days. We have decided that a single spur will serve a business of some type just off the frame to the left. 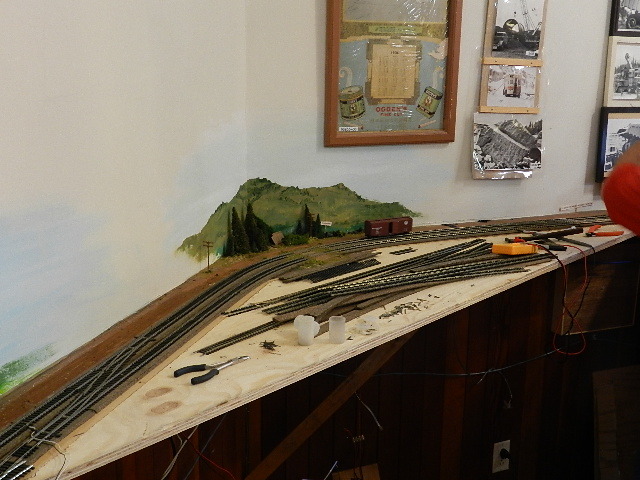 The ‘business’ is actually there to cover the switch machine that controls access to the station siding.